I’m not a political guy, at all. If you’ve read any of my previous writings, or followed my social media accounts, I’m sure you are nodding your head in agreement. I’d just as soon have a conversation about sports as I would politics (mind you I struck out in t-ball as a kid, so you know where sports rank for me conversationally). As someone who tries my best to look at this life through the lens of Christianity, I’ve come to see through my clouded lenses that us Jesus-people have come dangerously close to allowing politics to become the source of our hope and security for the future. We’ve put our hope in the wrong place. The more I’ve waded through the deep waters of God’s word, the more I’ve come to embrace the proclamations Jesus made of the Kingdom of God, proclamations which assure us that the promises of politicians are not our hope, nor our security; the promises of God are. As a result, I’ve typically run from anything political faster than green grass through a goose (it has taken nearly 30 years, but I’m finally learning to talk Southern). So in February, when a political sticker found its way onto my back truck window and a political sign found its way into our front yard, more than a few eyebrows began to raise. Was all of my Kingdom talk just out of convenience? Had I abandoned one security blank and picked up another? Did anything I’ve said through the years even sink in to my own soul? Really, I probably confused myself more than I confused anyone else. But here is what I’ve come to recognize as I continually try to clean the lenses I look through, sometimes God allows His Kingdom to collide with our ‘kingdom’ in a way that sets the stage for something that can impact the lives of millions of people. 6.7 million people to be more precise. As soon as I heard Bill Lee speak the words, “I’m not our hope, but I know the One who is“, I recognized the collision. No, I’ve never been a ‘political’ guy; but I’ve always tried my best to be an ardent supporter of those who live their lives as conduits of hope, joy, love, truth and faith in any arena. Over the years I’ve come to recognize Bill Lee as an extremely respected man in our community, but it wasn’t until I became the Chaplain for his company, Lee Company, that I really began to understand and appreciate just who Bill Lee is. During my short tenure with Lee Company I’ve heard countless stories about how Bill has made a dramatic, personal difference in the lives of those who work for Lee Company. Stories that will go forever untold to the public (thanks to Chaplaincy privacy rights). Stories that reveal who Bill Lee is when no one is looking and watching. Bill truly has made life better for the 1,200+ people that currently work for Lee Company, as well as the countless others who have adorned the Lee Company logo through the years. His story, one that is woven through faith, tragedy, family and service to others, speaks volumes of the man Bill Lee is. 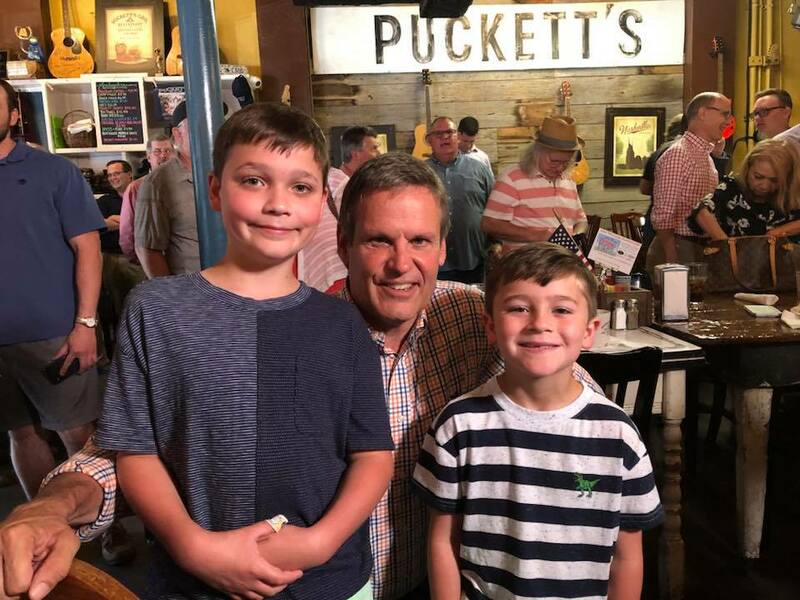 I’m not one to talk about job qualifications for the office of Governor (though Bill’s business successes amass quite a resume), but I am one to talk about a man who genuinely cares to make a difference in the lives of fellow Tennesseans. I am one to talk about a man who carries a very personal testimony and walks very closely to Jesus. I am one to talk about a man who recognizes just how important God’s Kingdom is, and how stewarding a State Governorship is an opportunity to also steward God’s Kingdom through it. I am one to talk about a man who is not pursuing a career in politics, but is pursuing an opportunity to love and serve others without limits through the office of Governor. While my stake remains in the ground for the Kingdom of God, I recognize we are firsthand witnesses to an overlap of the two with this year’s election for Governor of Tennessee. Please hear me when I say this (or should I say read me when I type this?). I’m not behind Bill Lee because I think he is going to use the platform for proselytization. That is not what I am getting at when I talk about God’s Kingdom versus ours as it relates to this contest for Governor. I am behind Bill Lee because he loves people. Regardless of their race, their creed, their status or their history. Bill loves people as God does and he wants to make life better for Tennesseans. I believe the way that he loves others and fulfills his responsibilities will speak for themselves in regards to Bill’s faith. For that reason, Bill Lee has my vote. I would implore you to consider voting the same, as well as clicking to share this post below.